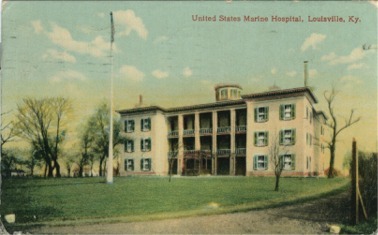 The history of the U.S. Marine Hospital is filled with remarkable challenges, accomplishments and personalities. Looking through our back pages reveals the important role the hospital had in our community’s medical history, river heritage and architectural character. On this page you'll find some interesting stories from our past. In the period following the Civil War, the U.S. Marine Hospital at Louisville was commanded by three remarkable local physicians. Dr. David, Dr. Thomas, and Dr. George Washington Griffiths each served as Surgeon-in-Charge of the maritime hospital. Natives of Wales, the Griffiths family moved to America in 1841. All three brothers studied medicine in Louisville and each established popular and successful medical practices. Ardent Unionists, at the outbreak of the Civil War, each made their contributions to the war effort and to medical service in Louisville. The Portland neighborhood recognized their contributions to the community by naming Griffiths Avenue, just a few blocks south of Portland Avenue, to honor their service. Medical service, and a commitment to the Marine Hospital, was a family tradition. In later years, Dr. William Griffiths, a son of Dr. George W., also became a physician at our hospital. Dr. David J. Griffiths is shown standing at far right of the photo. 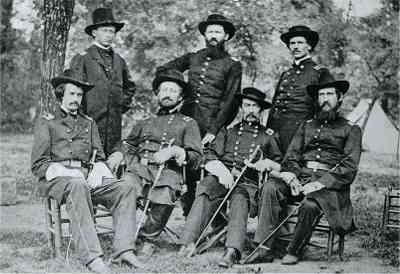 Seated in front row (second from left) is Major General William Rosecrans, commander of the Army of the Cumberland. To his right side is Gen. Philip Sheridan, who would soon take over command of the Cumberland Army following the Battle of Stones River. Dr. David J. Griffiths held the important position of Medical Director for General Philip Sheridan’s Division of the Army of the Cumberland and the Army of the Potomac. He earned a reputation as one of the finest surgeons in the U.S. Army, and was a trusted and important part of Sheridan’s command. 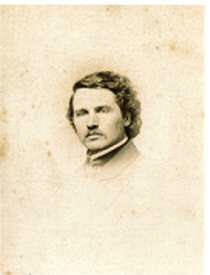 Dr. David’s heath was shattered by exposure and the stress of the War and he retired in late 1864. In 1869, he was named Surgeon-in-Charge of the Louisville U.S. Marine Hospital and was given the responsibility of re-opening the hospital. Our hospital was closed in 1863, and boatmen were transferred to the old Louisville Marine Hospital. Dr. David Griffiths, and the Sisters of Mercy, opened the hospital and began to again serve boatmen. He only served in this position for three months, when he became paralyzed and blind. He was forced to retire and lived his life as an invalid. At the end of his life, he lived as a patient in the hospital he helped resurrect. Dr. Thomas Jones Griffiths took over command of the U.S. Marine Hospital after illness forced the retirement of Dr. David Griffiths in 1869. Dr. Thomas would become the hospital’s most important medical professional and set the direction for decades of health care service. During the Civil War, Dr. Thomas remained a civilian and served as supervising physician for several Louisville military hospitals. At the peak of the war effort, Louisville hosted 21 General Military Hospitals, including the very large 800 bed hospital at Parks Barracks, on the future campus of the University of Louisville. 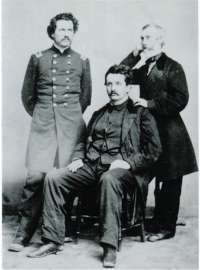 Dr. David J. Griffiths (standing on left), and his brother Dr. Thomas J. Griffiths (seated), are shown with Dr. Peck. This is the only known photo of Dr. Thomas Griffiths. Working with the Sisters of Mercy, Dr. Thomas Griffiths made the hospital in Louisville the largest of all inland marine facilities. At his retirement in 1877, our hospital served more patients annually than those in St. Louis and New Orleans combined. The youngest of the Griffiths brothers, Dr. George W. found his medical studies interrupted by the outbreak of the Civil War. He served with great distinction as Captain of the Second Kentucky Cavalry. Wounded at Chickamauga, and later captured, he was exchanged and served until the end of the War. At the end of the War, he was offered a commission as First Lieutenant in the Seventh Cavalry by General Ulysses S. Grant. He declined the commission and returned to medical studies. As a result, he was not serving with Gen. Custer when his command was destroyed at the Little Big Horn. Dr. George W. became a prominent Louisville physician and served as Surgeon at the Marine Hospital. He also served as President of the Louisville Board of Aldermen for twelve years and chief physician for the L&N railroad. His son, Dr. William Griffiths, continued the family tradition and served in the Marine Hospital.